You are buying Purina Vet Diets UR St/Ox Savory Selects Salmon For Cats 5.5oz 24 cans. ADW Diabetes offers the complete line of Purina specialty foods for both cats and dogs. We offer competitive pricing, fast shipping, and superior service. Trust ADW Diabetes for all of your pet diabetes and health care needs. 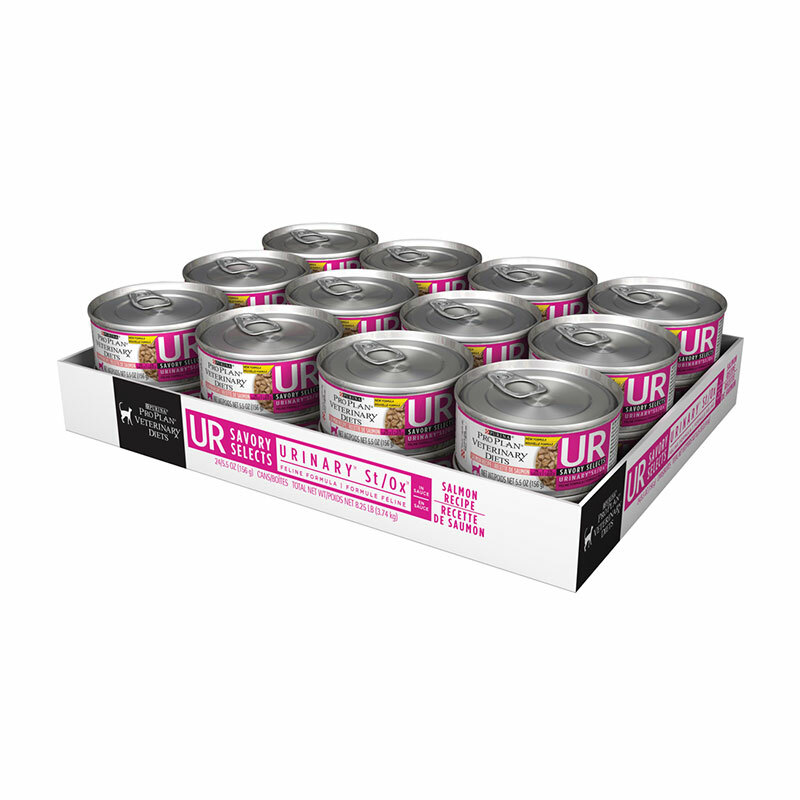 The Purina Vet Diets UR St/Ox Savory Selects Salmon For Cats 5.5oz 24 cans offers dietary benefits that provide optimal nutrition while meeting your adult cat's special needs. Case of 24, 5.5oz cans. Water sufficient for processing, salmon, liver, wheat gluten, chicken, corn starch-modified, artificial and natural flavors, soy flour, added color, sodium bisulfate, potassium chloride, tricalcium phosphate, salt, fish oil, choline chloride, taurine, Vitamin E supplement, thiamine mononitrate, mono and dicalcium phosophate, zinc sulfate, ferrous sulfate, niacin, calcium pantothenate, Vitamin A supplement, menadione sodium bisulfite complex (source of Vitamin K activity), copper sulfate, manganese sulfate, pyridoxine hydrochloride, riboflavin supplement, Vitamin B-12 supplement, biotin, folic acid, Vitamin D-3 supplement, potassium iodide.